Twelve U.S. warplanes joined forces to carry out a massive airstrike on a suspected chemical weapons production complex in Mosul, Iraq. It is believed that chlorine or mustard gas was being produced at the former pharmaceutical factory in the ISIS-held stronghold. 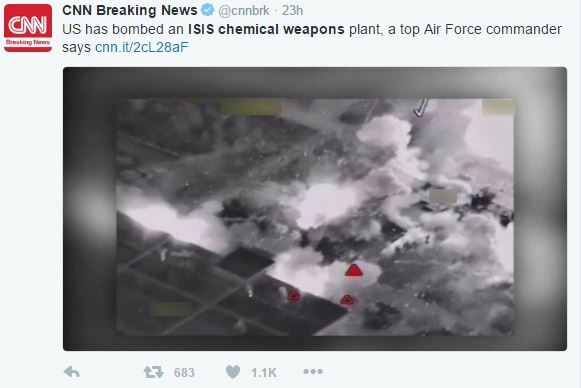 U.S. intelligence officials also believe that the chemical weapons factory doubled as a headquarters for ISIS commanders in the area. Several different types of military aircraft participated in the bombing. F-15s, A-10 Thunderbolts, F-18s, F-16s and a B-52 Stratofortress were all involved in the coordinated attack. Over 50 “points of interest” within the massive complex were successfully targeted. The attack is believed to be the second largest airstrike in recent months. B-52s and Belgian F-16s carried out a larger attack on a factory believed to be building Vehicle Borne Improvised Explosive Devices earlier this month.